A Benzene lawsuit is a personal injury or wrongful death claim brought against the manufacturer of a product containing Benzene. A Benzene lawsuit alleges that the manufacturer of the product that contained Benzene failed to warn consumers of the injury risks associated with Benzene exposure from using their product. A Benzene lawsuit alleges that the person bringing the lawsuit suffered a specific harm as a result of the Benzene exposure. This is known as “causation”. And that harm led to damages, both economic (lost wages and hospital bills) and non-economic such as pain and suffering. Certain types of leukemia have been found to be strongly linked to Benzene exposure. Examples include cancers such has acute myelogenous leukemia (AML), acute myeloid leukemia, and chronic lymphocytic leukemia. A Benzene lawsuit where someone has been exposed long term to a Benzene containing product and suffers from one of these conditions has the greatest likelihood of success in Court. Our personal injury lawyers are filing Benzene lawsuits against manufacturers of products containing benzene that causes harm. 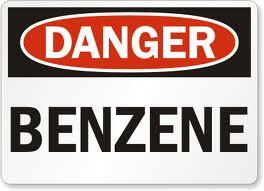 Benzene is a chemical found in many common products and is a known carcinogen. Benzene lawsuits allege that benzene exposure caused serious conditions such as acute myelogenous leukemia, acute myeloid leukemia, chronic lymphocytic leukemia. is the most common form of leukemia. It is also known as Acute Myeloid Leukemia, Acute graulocytic leukemia, and acute nonlymphocytic leukemia. Acute Myelogenous Leukemia is a cancer located in the bone marrow tissues. Bone marrow failure occurs as malignant cells replace normal bone marrow. Acute myelogenous leukemia is diagnosed by the growth of immature white blood cells. Treatment for acute myelogenous leukemia include chemotherapy, immunotherapy, and stem cell transplantation. Radiation therapy is sometimes used for leukemia in the central nervous system or elsewhere and for pain caused by bone destruction. is a malignant disease characterized by large numbers of immature white blood cells. These cells can be found in the blood, the bone marrow, the lymph nodes, the spleen, and other organs. Information and commentary provided by Dallas Fort Worth Personal Injury Wrongful Death Attorney Dr Shezad Malik. The Dr Shezad Malik Law Firm can be contacted in Dallas toll free at 888-210-9693. If you or a loved one has been injured or killed from Benzene exposure, please fill out our contact card for a free consultation.